Warning: Had an itsy, bitsy, little spoiler. Don't read unless you've read the first two books! 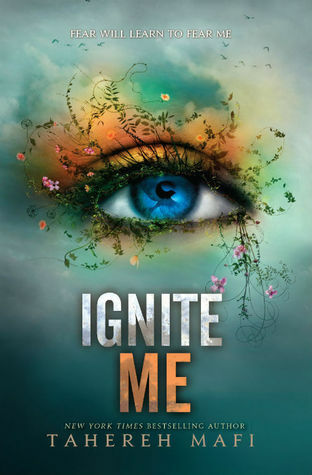 Ignite Me is the last installment of Shatter Me trilogy by Tahereh Mafi. When I read the first book, Shatter Me, I was awed with the beautiful and promising concept. Everything about it was good--except for Juliette, the female protagonist. I hoped that I'll meet a new Juliette on the second book, Unravel Me. UM was amazing. I liked the flow of the story and the new characters..but Juliette remained the same. I realized I loved Warner--the "bad guy" then--than Juliette, the "good girl". So I was torn! I love the story and everything about this trilogy but the main character--who should be making the story more beautiful--kept hidden on the corner. Scared. Hard-headed. Full of self-pity. Weak. I don't know what I'll do if she won't stand up and fight back; to do the things she kept on saying on the first two books. Nonetheless, my excitement with Ignite Me was so high. I can't wait to find out how will it end and read more and have Warner feels. Ahh, Warner. *sigh* And this book never failed me to fuel Warner feels. From chapter one til the last, Aaron Warner is all over. But it's not just the feels! I have learned more about him. His past, his thoughts, and his *coughs* soft spot in fashion. YES YOU'VE READ THAT RIGHT, AND I THINK IT'S REALLY CUTE. WARNER + FASHION = TOO CUTE. I met the real Aaron Warner and saw the changes he's willing to make and it made me love him even more. (#TeamWarner all the way!!) I almost think this is about him, not Juliette. I noticed that there are no strike-throughs anymore (just like I did above) compare to the first two books. Juliette was described as mentally ill girl and Shatter Me contains her thoughts--which is full of counting, repeating words, and strike-throughs. I realize then that the absence of strike-throughs meant she's well and she finally made her decision. To fight back and stop being coward. I liked her new strength and perseverance. Adam, in the other hand, went downhill. From the knight and shining armor character in Shatter Me, he became the hard guy on Ignite Me. It wasn't Juliette I didn't liked this time. It was Adam. If I've learned a lot from Warner, here I don't think I know Adam at all. Despite being the new cold him, I feel bad for him for everything that has happened to his life. Though I loved Warner so much and I liked how Juliette transformed, the ending was lacking, for me. It seems like more than 3/4 of the book was spent with romance and transformation but the real action was just told in a couple of pages. It was too fast and too easy to be believable. So if you'd ask me if this book contains action, I'd say yes, but not too much. Just the ending. Ignite Me showed improvements with the characters and the story as well but I wouldn't say I'm contented how they achieved the peaceful ending. Still, I recommend this book to fans of the first two books and for those who haven't read Shatter Me. Mixed with heart-warming romance and unusual powers, Shatter Me is a dystopian series you'd want to read. Check out my review of Shatter Me (book one) and Unravel Me (book two). I loved this series so much! Awesome review! !